LAOAG CITY, January 12 (PIA) – The Mariano Marcos State University (MMSU) in Batac City has topped the the overal percentage result of the 2015 Nurse Licensure Examination (NLE), according to records of the Professional Regulation Commission (PRC). MMSU scored 100 percent in the nationwide examination. It shared the top post with the University of Sto. Tomas and Xavier University. 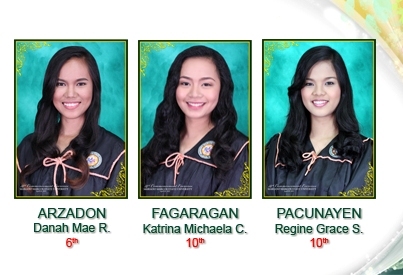 Among the 74 examinees from the MMSU-College of Health Sciences, three were topnotchers namely: Danah Mae R. Arzadon, 6th placer while Katrina Michaela C. Fagaragan and Regine Grace S. Pacunayen both landed in 10th place. “What a fitting gift to our university as we celebrate 38 years of excellence and service. This achievement was made possible by your brilliance and hard work, but also by your love: for the profession, for your family, for our country, and for Mariano Marcos State University,” MMSU officials told the passers in their official Facebook page.